One of the things I missed most about leaving Houston was my monthly book club meeting. Our group was much more than lively conversation, often on topics far beyond the book we were meeting to discuss. Book club prompted me to read books I might not normally choose and to explore topics I may not dig into on my own. It forced me out of my box. Parnassus Books, a tiny jewel in exploding Nashville, is crowded on this weekday afternoon. In today’s world of electronic readers and tablets, it is refreshing to see people who still love browsing the shelves, studying the actual covers, and flipping the pages of real-live books. “We are glad for them also,” laughs Kathy Schultenover, a book aficionado in this cozy shop. Always an avid reader, Kathy reached out to fellow Air Force wives and invited them to her home for book clubs. “As I look back, I had no idea I was planting the seed for what I would do later,” she smiles. After landing in Nashville for her husband’s new job, Kathy did some teaching and then found her groove at Davis-Kidd Booksellers, the city’s only bookstore at the time. One day, approaching her boss with the idea of starting a store book club, Kathy received a lukewarm response. He gave Kathy the go ahead but cautioned her “not to get her hopes up” about the notion. In later years, that same boss loved to laugh with Kathy and say, “I am so glad I was wrong.” Although the book club was a rousing success, the store closed abruptly in 2010. 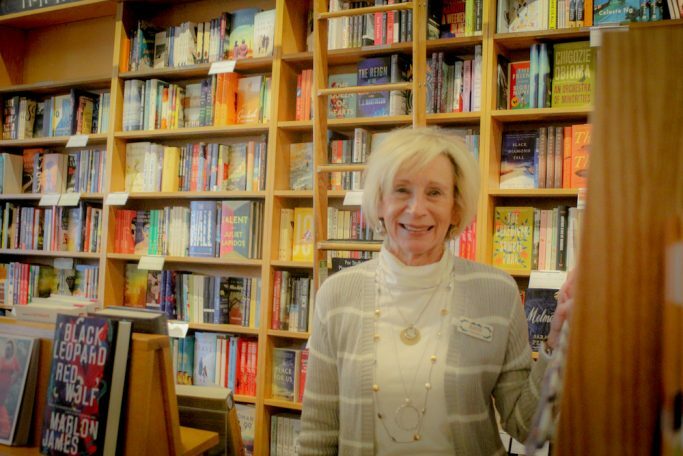 “As silly as it may sound to some,” says Kathy, “the store’s closing was one of the toughest things I’ve had to deal with.” She was employed there – working hard to build the book club and store business – for 17 years. “We were like a family,” she continues quietly. But, like a lot of messy things in our lives, some good invariably comes. Hired by novelist Ann Patchett and publishing house veteran Karen Hayes, Kathy helped get a new bookstore up and running in the city. In November 2011, Parnassus Books opened its doors. When she’s not assisting customers with selections or shelving books or working with authors for events, Kathy coordinates the book club program at the store. One of the clubs, focusing on current fiction, meets three times a month at various times convenient for all readers. The Classics Club, meeting every other month, discusses works written before 1970. Kathy “loves facilitating the meetings, which attract smart, articulate, huge readers.” And quieter spectators also. The gatherings offer folks a built-in social setting, the chance to read and talk about the chosen book, and the opportunity to meet like-minded people. All with no commitment, registration, or fee. Gaping at the back room of the shop, stuffed with hundreds of advance copy books, (How can I get this job?!) I wonder how Kathy possibly picks one to read? “Unless it might be an established author, I am not the person grabbing the latest and the greatest,” she admits. “I am the reader who waits to hear what others think – customers, staff members, reviews, media,” she continues. Winding our way through the shelves and tables of books, stopping to pet the shop dog, we discover our similar taste in books. Not surprisingly, Kathy has read most I pick up and examine. Knowing I love historical fiction, Kathy points out her staff pick for this month – The Only Woman in the Room by Marie Benedict. (Benedict’s Carnegie’s Maid was a good one too.) Although I’ve seen the recent Hedy Lamarr movie, I’m anxious to read the broader account of the beautiful actress, her amazing intellect, and her role in the wireless communication industry. LOVE this sweet story of her passion and the seeds she planted! You never know where the road can lead in life! Thank you Pam…for sharing.